Last month, the U.S. Food and Drug Administration expanded its authority over tobacco products and issued new regulations that affect how a cigar company can sell its premium or machine-made cigars. As part of the new rules, cigarmakers must seek approval from the FDA in order to launch a new cigar or continue selling a cigar that's currently on the market. The FDA offers three pathways to product approval: Substantial Equivalence, Exemption from Substantial Equivalence (SE) and a Premarket Tobacco Application (PMTA). The approval process will require cigar companies to submit costly and time-consuming health and information reports to the FDA. Many cigar companies are looking at an initial reporting cost of more than $22,000 for a single SKU. However, not all cigars will be forced to undergo such rigorous evaluation. Cigars that were on the market on February 15, 2007 are exempt from the FDA's premarket reporting requirements. Still, companies with grandfathered cigars will have to submit information to the FDA proving the age and longevity of their products. A cigar that was introduced to market before February 15, 2007 but then lapsed in commercial availability must have returned to market by that date in order for it to be grandfathered. Cigarmakers may use dated receipts, advertisements and invoices to prove a cigar's age statement. The FDA estimates that 60 percent of cigars on the market today will be grandfathered. The remaining 40 percent of the cigar market must use one of the FDA's three pathways to product approval—Substantial Equivalence, Exemption from Substantial Equivalence or a Premarket Tobacco Application—or exit the cigar market. For many cigarmakers, the Substantial Equivalence pathway will make the most sense for new product approval. The FDA estimates that 25 percent of the cigar market will file some form of SE report. An SE report is designed to show that a new tobacco product has similar characteristics to a grandfathered (predicate) tobacco product, or has different characteristics, but doesn't raise any new questions of public health. A cigarmaker does not have to manufacture any predicate tobacco products to use the SE pathway; it may compare its new cigars to the grandfathered cigars of a different manufacturer. The FDA states: "For the SE pathway, a manufacturer may utilize any eligible predicate tobacco product, including one they do not manufacture. If manufacturers do not have predicate products, which were on the market as of the grandfathered date, they have the option to select a different premarket review pathway or work with other manufacturers that have eligible predicate products." The FDA notes that there are various types of SE reports that a cigarmaker can submit, some more extensive and time consuming than others. Breaking down the 25 percent of the market that will utilize the SE pathway, the FDA estimates that 5 percent will file a full SE report; 10 percent will file a Same Characteristics report; 5 percent will file a Bundled SE report; 4 percent will complete a Product Quantity Change report; and one percent will complete a Bundled Product Quantity Change report. While a "full" SE report represents the most detailed and complete version of an SE report, the other types of SE Reports (Same Characteristics, Bundled Substantial Equivalence, Product Quantity Change, Bundled Product Quantity Change) are essentially streamlined or combination versions of the full SE Report that are less costly and time consuming for a cigarmaker to complete. The FDA explains: "In some circumstances manufacturers may be able to submit a shorter substantial equivalence report." • Same Characteristics SE Report: If a new cigar product has the same characteristics as a predicate product, but possesses a distinct attribute (such as a different name), the cigarmaker can submit a Same Characteristics SE Report. • Product Quantity Change SE Report: If a new tobacco product is the same as a predicate tobacco product and the only difference between the two is a change in product quantity, and the per-weight composition inside the package remains identical, then the cigarmaker can submit a Product Quantity Change SE Report. • Bundled SE Reports: Cigarmakers may also combine, or bundle, reports together that are similar. For example, if a manufacturer wishes to submit SE reports for multiple vitolas in a cigar line, such reports may be submitted together in a Bundled SE Report. Multiple Product Quantity Change Reports can also be bundled together in a Bundled Product Quantity Change Report. "When groups of Substantial Equivalence reports are submitted by the same manufacturer for the same product category and sub-category, they may be bundled; when a group of similar reports are bundled, the subsequent bundled reports are expected to take less time to prepare than the initial report. This further reduces costs." While the exact costs of these reports will vary, the FDA estimates that an initial full SE report could cost more than $22,000. This number is based on the amount of hours the cigarmaker will need to complete the report (300 hours) multiplied by a composite wage of tobacco industry professionals who will need to contribute to the report in order to complete it. The FDA believes a mix of varied professionals will be required to complete the report (legal professionals, engineers, scientists, etc. ), so it combined the estimated hourly wages of different occupations into one composite wage, then doubled the number to account for other costs, which results in an approximate hourly cost to the cigarmaker. "We use a mix of 30 percent life, physical and social science occupations; 20 percent architecture and engineering occupations; 30 percent office and administrative support occupations; and 20 percent legal occupations. This mix yields a composite wage of $37.98. We double this to account for benefits and overhead, yielding an hourly labor cost of $75.96," the FDA said. The FDA then multiplies this number ($75.96) by the estimated number of hours the various industry professionals will need to complete the report (300 hours), which yields more than $22,000 in estimated costs to the cigarmaker. However, when subsequent full reports are bundled (which means combining multiple reports for similar products), the FDA estimates that the cost will go down substantially for the cigarmaker, with a typical bundled full SE report taking only 90 hours to complete and costing less than $7,000. Another way a cigarmaker might seek market approval from the FDA is through an Exemption from Substantial Equivalence. A cigarmaker can use this pathway to approval if its new product is a slight tobacco modification to one of its grandfathered tobacco products. Both products must be owned by the same manufacturer. (This requirement is different from the rules of an SE report, which state that any predicate tobacco product can be used, regardless of manufacturer, to compare against the new product.) For an Exemption from Substantial Equivalence request to be valid, the minor tobacco modification must be based on adding or deleting a tobacco additive, or increasing or decreasing the quantity of an existing tobacco additive. This pathway might prove useful to manufacturers wishing to modify a grandfathered machine-made or flavored cigar (cigars that typically contain natural or chemical additives). The FDA defines a tobacco additive as "any substance the intended use of which results or may reasonably be expected to result, directly or indirectly, in its becoming a component or otherwise affecting the characteristic of any tobacco product (including any substances intended for use as a flavoring or coloring or in producing, manufacturing, packing, processing, preparing, treating, packaging, transporting, or holding), except that such term does not include tobacco or a pesticide chemical residue in or on raw tobacco or a pesticide chemical." The FDA estimates that an Exemption from Substantial Equivalence application will take 19 hours to complete and cost less than $2,000 for the cigarmaker to prepare. Based on its market research, the FDA estimates that 10 percent of the cigar market will use the Exemption from Substantial Equivalence pathway. Finally, if a cigarmaker cannot prove that its new cigars are substantially equivalent to a grandfathered tobacco product, or file for an Exemption from Substantial Equivalence, the cigarmaker can complete a Premarket Tobacco Application. Such applications are typically reserved for tobacco products that raise new or different questions of public health compared to grandfathered products. 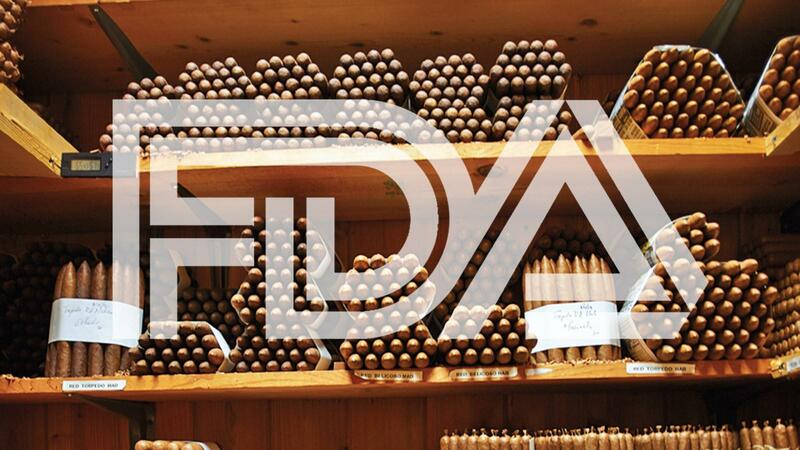 Because most new cigar products are fundamentally similar to grandfathered cigar products, the FDA does not believe a typical cigarmaker will have to use the PMTA pathway. However, the option to use the pathway remains, nonetheless. If a cigarmaker chooses not to utilize any of the three pathways to market for its non-grandfathered cigars, whether due to costs or other factors, the cigar products will be forced to exit the market. The FDA estimates that 5 percent of the market will exit the playing field. The FDA's premarket approval rules for cigars go into effect August 8, 2016. For newly deemed tobacco products, the deadline for submitting an Exemption from Substantial Equivalence request is 12 months from the effective date of the final rule (August 8, 2017). For submitting an SE report, the deadline is 18 months from the effective date of the final rule. A cigarmaker gains an extra 12 months of compliance after the start date if it submits its application during the initial compliance period. In order to give tobacco manufacturers ample time to adjust to the new premarket review requirements, the FDA does not intend to enforce the deadline for the first two years. Multiple cigarmakers have confirmed with Cigar Aficionado their intention to file SE reports. Erik Hanson, owner of the Hammer + Sickle cigar brand, recently released a press release stating his intention to file for SE reports for all his brands, but noted he was awaiting further instruction from the FDA. "We are all awaiting FDA guidance on filing," Hanson told Cigar Aficionado. Ernesto Padilla of Padilla Cigar Co. confirmed that eight of his brands will be grandfathered and that he will be seeking SE for his other lines. "We will be filling for Substantial Equivalence with FDA in the time frame required," Padilla stated.